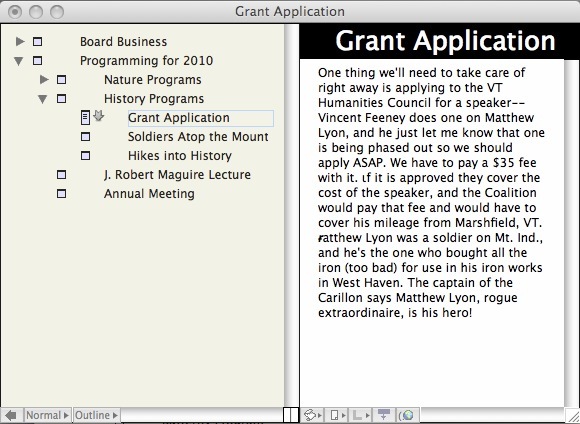 When you create a new document (or database), you are presented with a blank window pane. This is an empty Outline View. Just start typing to create your first headline/note. When done, hit the RETURN key. Hit it again to create a new note. This series of posts is not intended as a tutorial, so I won’t describe how to build an outline in Tinderbox, other than to say it is pretty intuitive for anyone who has used other outliners (i.e. drag and drop, tabbing to indent, etc…). 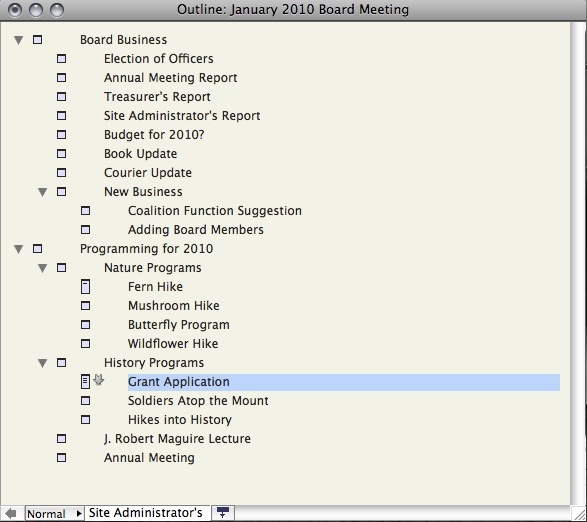 Note that the outline has the typical-for-Mac triangular disclosure icons that indicate those notes that have sub-notes, and allow you to show or hide those subordinate items. Keep in mind that what you are seeing here is a hierarchical list of the titles for notes, not the full notes themselves. I covered notes in the previous post, but here’s a picture of an open note with the outline in back. Back to the outline, you’ll also see a little rectangular box to the left of each note. This box is an iconic version of the note window. Some of these boxes are elongated and have lines in them. This indicates that the note has text in addition to the title. There are other visual indicators in the Outline View, but I’m not yet familiar enough with them to describe them here now. 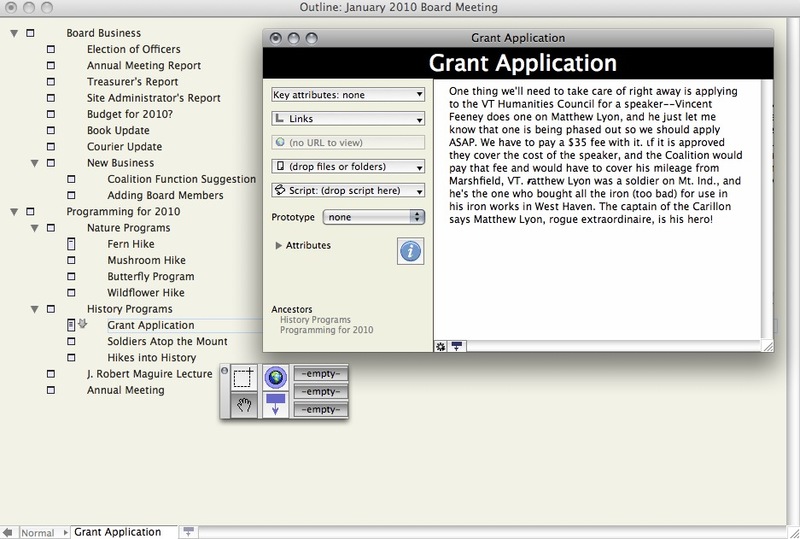 And for those who like or prefer a two-pane outliner, the Explorer View provides a familiar interface. 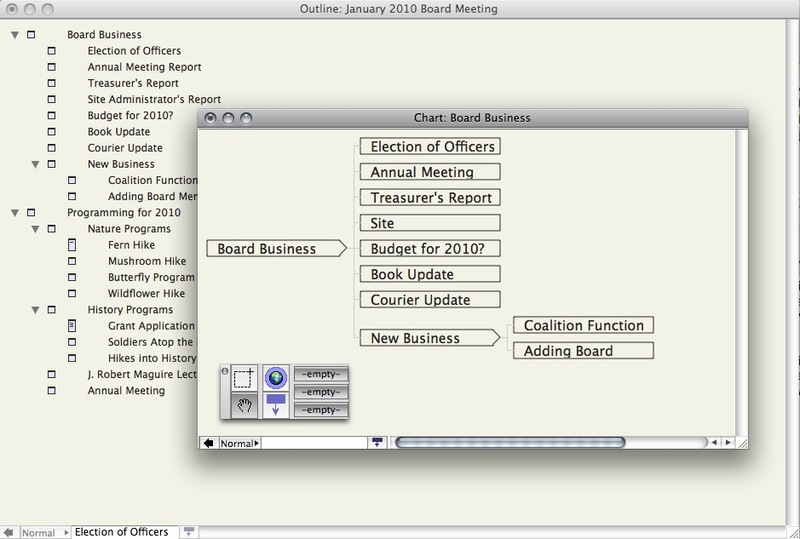 The above image shows a Chart View hoisted to the Board Business heading, and not the entire outline. For those not familiar with the concept of a hoist, it means that the information on the screen is limited to one headline/topic and its subheads. This is considered a crucial function in any serious outliner or mind mapper. Hoist or its equivalent is available in all Tinderbox views. There are other views, but I have not explored them much myself yet. These four are simple to use for brainstorming, planning and organizing. There are power functions that will help you get even more from your data, and I’ll start to examine these in the next installment. Keep it up, V. Bernstein has been promising a PC version for some years now and I’m intrigued, so solid information about the program is welcome.